Disadvantages of the Articles of Confederation would be that the government could not enforce laws (meaning states could ignore them), government could not tax, 9 out of 13 states had to approve in order for a law to be passed, all 13 states were needed to amend a law, provided no judicial branch, and it caused the states to suffer economically especially when each state started taxing one another and hurting trade. 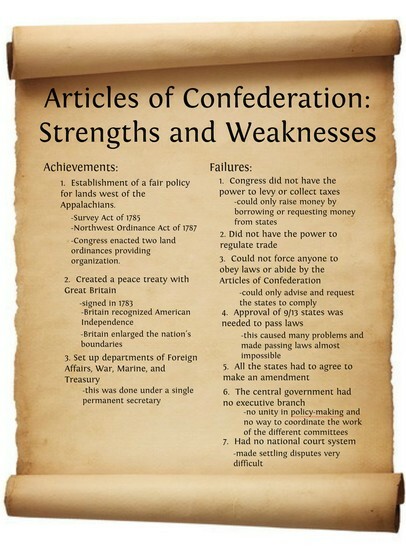 Advantages of the Articles of Confederation would include a unified army for the United States, balances out voting (each state gets one vote), built and controlled an army, and made the ability to deal with foreign countries on behalf of the states. I believe this created a weak government because the government had very few rights. The government could not tax, or even enforce laws. Government is suppose to provide and protect. With this, they were unable to protect. They could make laws, but nobody had to follow them. The government could not tax, which made what was being provided to the people even more expensive because everyone began taxing everyone over everything.